The inside cover flap says, "This is not a restaurant guide - it is a book all about food and the people who make, sell and care about it." This is a whirlwind sweep of interesting (and sometimes great) eating establishments, cafés, and artisan stores across one of the most wonderful cities in the world - London. I appreciate that there isn't too much information about these eating places, leaving the potential visitor something to discover for themselves. Terence Conran is a well known restaurateur/businessman, and Peter Prescott has worked with him for years. Together they've covered a wide area of London and come up with eateries (and markets) based on different areas - see the cover for details. 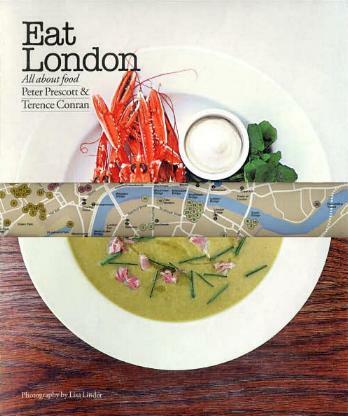 Having lived in London myself in the mid to late eighties, and on a severe budget, I recall the areas and just a few restaurants featured in the book. Do make sure to check before you leave for London whether or not the place/s you'd like to visit are still in business. Restaurants are notorious for disappearing off the face of the earth. What I liked about this book is that not only is there a wide variety of types of restaurants, there are also many recipes we can try for ourselves. Not only do they comment on the food, but also the service as well. Quotes from well known chefs/restaurant owners are also included. I'm with co-author Peter Prescott when he says, "Certainly, I harbour a bias towards humble, simple dishes, no frills cooking, strong flavours and gutsy regional foods," and I also love this: "If a dish is over-dressed or garnished, for me it signals that the chef is trying too hard to compensate for a shortcoming." That's telling it like it is! "English food" is a misnomer - it's completely different these days. I love the very clever dustjacket - do check it out, especially if you're going to London any time soon. Some of the more eccentric restaurant names include The Flea Pit, The Pig's Ear, and Crazy Homies. Conclusion - A joy of a book to savor, and a must to go through before your travels.